PHILADELPHIA, PA – June 1, 2016 – Janney Montgomery Scott LLC announced today that Jeffrey J. Smith, Senior Vice President, has been promoted to Head of Recruitment and Business Development for Janney’s Private Client Group. Mr. Smith was previously a Complex Manager in the firm’s Washington DC office. Mr. Smith will relocate to the firm’s Philadelphia headquarters in Summer 2016. 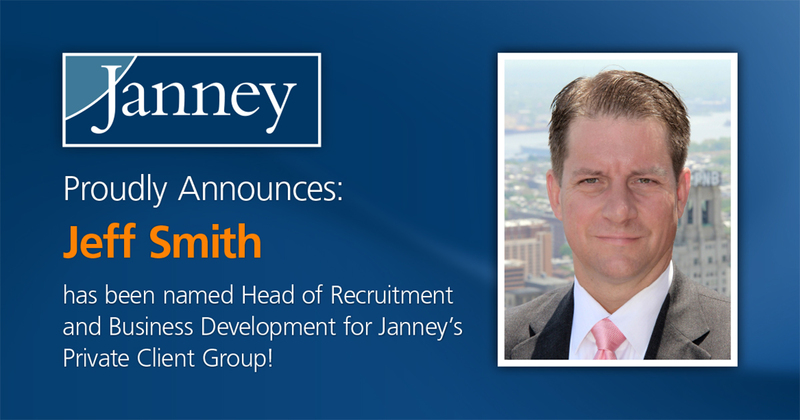 In this new role, Mr. Smith will lead the Private Client Group’s efforts with organic growth and the recruitment of advisors to the firm. “The energy, experience and focus Jeff has is unmatched and we’re excited to have him in this role. He has led by example in Washington DC improving both organic growth and recruitment results through his ethical, collaborative and resourceful approach. We anticipate he’ll leverage this experience and the Firm’s unique strengths - our people, platform, and technology - to expand his success from DC to across our entire footprint”, said Jerry Lombard, President and Head of Janney’s Private Client Group. “Janney is a strong option for advisors in today’s competitive environment. I’m looking forward to telling our story to attract quality advisors to join our firm and educate them on how our platform can help build their business by effectively meeting client needs,” said Jeff Smith. “I’ve seen advisors thrive after moving to Janney from across the spectrum of types of firms in our industry – from wirehouses, independent firms and the bank channel. We provide an incredibly supportive environment and platform for advisors to do their business how they choose and in the best interests of their clients,” he continued. With over 20 years of wealth management experience, Mr. Smith joined Janney in late 2012 as Complex Manager for the National Capital Area including offices in Washington, DC and Alexandria, Virginia. His experience also includes branch manager at Morgan Stanley Smith Barney, Director of Sales for Legg Mason which included leading the merger of the Alexandria, VA Legg Mason office with Smith Barney, and later, overseeing the unification of the Smith Barney branch with Morgan Stanley. Jeff serves on the Towson University Foundation Board of Directors and is also a member of Janney’s Branch Manager Leadership Council. In 2015, he was named to the “On Wall Street” list of Top 100 Branch Managers. Janney’s Private Client Group has a total of $66.2 billion in client assets under advisement. Thus far in 2016, the firm has opened two new offices in Cincinnati, OH and Harrisonburg, VA, and welcomed 20 new advisors with average production of $778k and average AUM of $94.5 million. In total, Janney has 748 financial advisors and 103 offices.